Tomato diseases, millipedes v centipedes, crop updates, cabbage white caterpillars. Although pretty dejected, I have cleared everything suspicious, including the brownish tomatoes, and we will see. In clearing, I spotted a black millipede: I got rid of it, remembering that my book says millipedes bad (two pairs of legs per segment), centipedes good (one pair of legs per segment). How comes I find it so difficult to kill most insects?!? After that, thought it better to dig my sorrows in, so I finally dealt with the strawberries' runners. Now some are planted and the others are in a pot with water to stimulate roots' growth (it has worked before). The transplanted fennel was doing ok, so I thinned out another row. No sign of barbe di frate yet, but phacelia is already germinating and so is cime di rapa - finger crossed, as brassicas have not been one of my most successful crops so far. 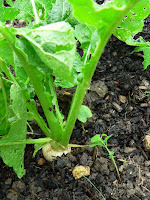 That said, the turnips (Rapa bianca lodigiana) - which I had dispared of given their genus's destiny - are finally forming underneath the hole-riddled leaves. Creature-wise, this is most definitely the season of cabbage white caterpillars: alive or dead they are everywhere (they seem to have a masochistic tendency to drowning in water butts and tanks, when they are not eaten from the inside by the parasite Apanteles glomeratus). There was something swimming in the rainwater in one of my pots, looked like minuscule tadpoles, so I poured them in the pond: maybe the other day's frog has left a legacy after all!